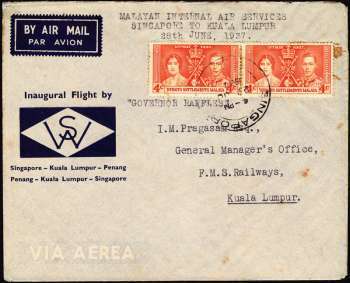 First Flight Cover to inaugurate the first passenger air services by Wearne's Air Services. This is a special commemorative as it marks historical point in the country and for being the first batch of mail being taken by WAS during its maiden civil flight. 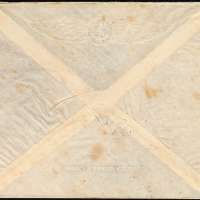 CONTENT: A card is in the cover, but the envelope has never been opened. Therefore the content will remain a mystery. Cover dimension: 152 x 124 mm. Cancellation date was 27 June 1937, a day before the actual flight took place. 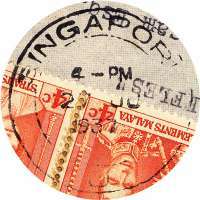 It is assumed it was cancelled in large sums at the General Post Office which was only 3 miles away from Kallang Airport. 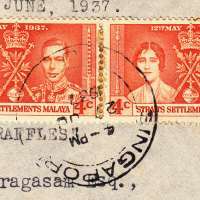 Kuala Lumpur was the seat of the Federated Malay States. Two stamps of 4 cents each tied with one double CDS cancellation on each.